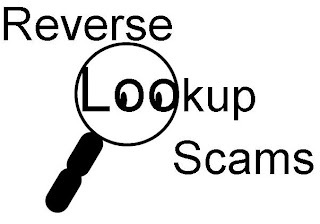 There are a lot of scams out there today, yes, even reverse cell phone lookup scams. Lets look at some of them. First if they say they do it for free...it is a lie. I have never seen a free cell phone lookup. Yeah, it is free to search, just not free to get a report. As a matter of fact they give you basically the same report as the phone validator (I will go into that one later). So if it says Free - Don't believe it. Just search here on my thingy - to find the name will cost you, but hey, I am telling you up front it will. What I found in searching 20+ sites, is they all lead to three regular pay sites. I don't think the pay site folks are scamming you, I think that people come up with phony "landing pages" to get you to a pay site. I say don't give those kinds of people your business, after all they got you there under false pretenses. Then there was this place for $6.95. Way too cheap. I tried 3 good phone numbers - guess what - none of them worked. It seems that you need to pay for quality look up services. If you find a free one that really works, let me know. The old saying, if it sounds too good to be true, then it probably is. That is true for this scam. Just use the Reverse Phone Detective. It works.